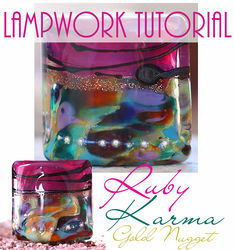 The Ruby Karma Gold Nugget is filled with upscale unique ingredients that combine to create a dazzling bead. In this eBook we give you step-by-step instructions with full color photos for reproducing this exact bead design. We used the Nugget shape, but this design works well in Lentils, Barrels, Sprees, and other shapes as well. Ingredients and Resource links are provided with the instructions. We will email the file to you within 24-48 hours during the business week. >Sorry but you may have to wait through the weekend for your file if you order at that time, Mon-Fri, 9am-5pm MDT are our normal working hours. Thanks for respecting that we are in the studio making beads too and not always on the computer.